Just 20 cm x 15cm x 6cm in size. 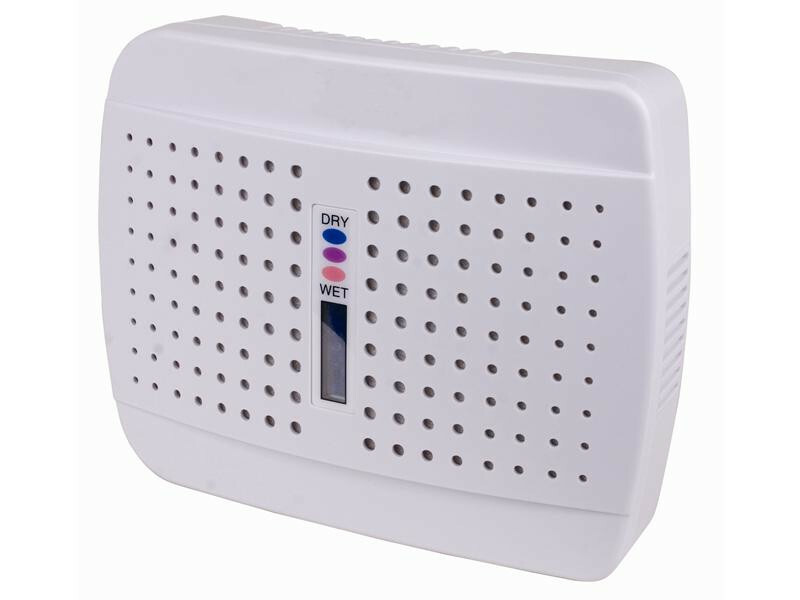 This small white dehumidifier contains 300 grams of dessicant crystals which absorbs moisture from the air to maintain a dry environment in small, still air conditions. When the crystals are exhausted the sealed indicator window in the centre of the unit will turn from blue to pink. To regenerate the crystals simply plug the MINI into the mains using the lead supplied and leave it for 10 hours. Once regenerated, unplug and re-use the MINI as required. The MINI is the simplest, safest, and cleanest way of controlling excess moisture in small areas. No wires or batteries are required in operation as the process is completely natural. Unlike other solutions that use tubs of silica gel, there is no mess, no spillage and no health risk - nor any water to be drained. (The DiO MINI is not suitable for large scale areas or volumes such as complete rooms, houses, garages, caravans boats etc - it is simply too small to do this. A conventional dehumidifier is the answer under these circumstances).